What is the print resolution output? 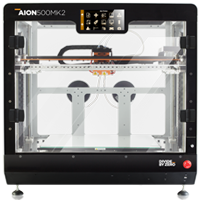 The printer can print at 100-250 microns layer height with 0.4 mm nozzle diameter. What is the difference between Layer Resolution and Print Accuracy? Layer resolution is the material stacking height for additive manufacturing i.e. the distance between two consecutive layers. Print accuracy is the degree to which the result of a measurement conforms to the value in the 3D design. How do you take care of shrinkage after cooling in the 3D models? Shrinkage of the models is calculated in the software. The material flow, speed, and infill width is calculated according. This process is completely automated, our software comes with profiles for different materials. Is post processing required on printed parts? In most situations, you can peel away the support structures from the model. ABS parts can be further sanded, milled, drilled, tapped and painted for added aesthetic value. What is the warranty of a Divide By Zero printer? The printer warranty is 12 months from your installation date. The reel that is supplied with your 3D printer usually contains 800g of filament. The amount you print per kg varies with the amount of raft and support material required. Roughly, the average amount is less than Rs. 2 per cubic centimetre (approx). The easiest way to calculate the cost of the material that will be used for your model is to use the print preview option under the 3D Print menu. This application will calculate the total weight of material used, including the raft and any support material. Cost to Print = Weight of Model x (Cost of Spool/Full Spool Weight) + Cost of electricity. Can we resume the print after a power cut? Yes. Keeping in mind unstable power supply conditions across many parts of the world, our 3D printers are designed to resume printing after a power cut or interruption. What are automatic support structures? 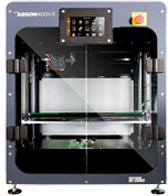 While the printer is laying the model down onto the heated platform, the printer uses the same extrusion head and lays down low density support structures. If you imagine printing a standing up letter “T”, it would require supports to be laid for it all the way up to the top, so that the 3D printer has a base to print the crossbar on. In a nutshell, support structures act as scaffolding. They aid in the construction of parts and are removed in the final stages. 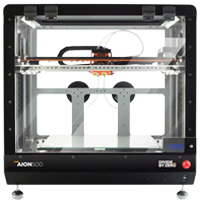 Are Divide By Zero 3D printers supplied with print material? Yes. Our 3D printers are supplied with a complimentary starter filament spool. Below is a list of the materials.